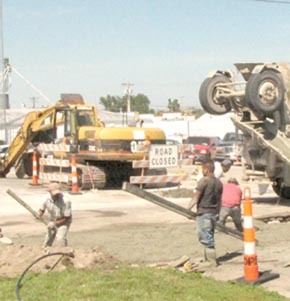 Concrete work has been underway at a rapid pace on Third, Fourth, Fifth and Sixth Streets in Albion. Workers from A and R Construction were pouring new concrete cross pans and gutters for drainage at each intersection. This photo was taken at Third and Marengo last Friday. 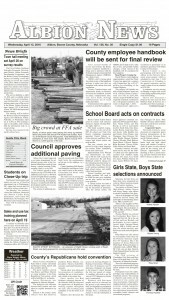 Milling of asphalt was scheduled to begin Wednesday.